Ricotta is a fresh, soft, snowy white cheese with a rich but mild, slightly sweet flavor. Mention ricotta and the first thing to come to mind is probably a classic Italian lasagna, but it also works well in many desserts. Learn about ricotta and how you can make it and use it. Technically, ricotta is not a cheese at all, but a cheese by-product. Its name, ricotta, means cooked again, an obvious reference to the production method used to make it. 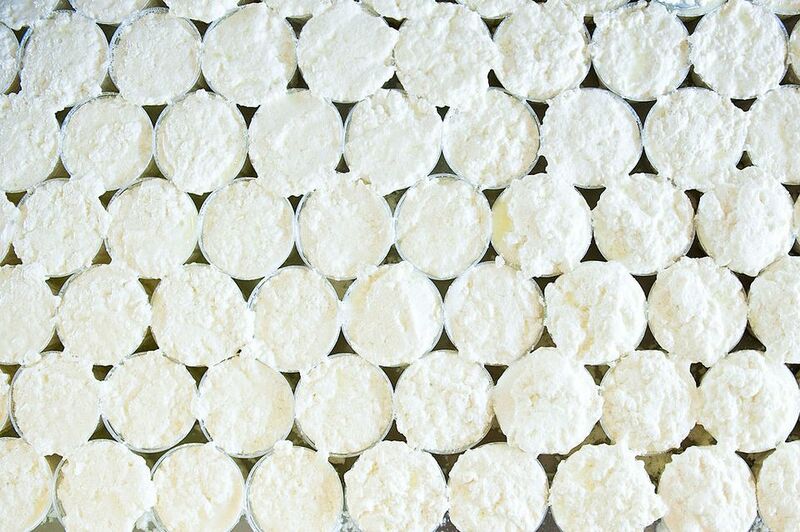 Ricotta comes from Italy, where it produced from the whey drained from cheeses such as mozzarella and provolone. It could be made from the milk whey of any dairy animal, including cows, sheep, goals, and Italian water buffalo. In America, ricotta is generally made with a combination of whey and whole, low-fat, or skim cow's milk. Unrelated to soft ricotta, ricotta salada is made of sheep's milk. The liquid is pressed out and the solids are compacted into rounds, enabling it to be cut with a knife. Its texture is crumbly but firm. The texture of ricotta is much like a grainy, thick sour cream. Ricotta is naturally low in fat, with a fat content ranging from 4 to 10 percent. It is also low in salt, even lower than cottage cheese. Since ricotta is made primarily from lactose-rich whey, it should be avoided by those who are lactose-intolerant. Ricotta cheese is a good source of calcium. One-half cup provides 42 percent of the recommended daily allowance of calcium. To form curds, the whey or milk is acidified by natural fermentation or by adding an acid such as lemon juice, vinegar, or buttermilk. Alternatively, rennet could be added. Once acidified, the whey is heated almost to boiling. This causes the proteins to clump together and curds to form. The curds are cooled and strained. It is easy to make ricotta at home. A half gallon of whole milk and two cups of buttermilk will produce about 1.5 cups of ricotta. If you overcook the ricotta while making it, the curds will be tough (although still edible). It should be heated to just below the boiling point rather than brought to a rolling boil. Ricotta is often used in lasagna and other Italian casseroles, and in stuffing ravioli, manicotti, and types of pasta. In desserts, it can be used like mascarpone in cheesecake or blended with sugar, spices, and flavorings and used to fill cannoli or as a layer cake filling. Ricotta can substitute for mayonnaise in sandwich fillings. It can be used in omelets and quiche. Ricotta cheese is highly perishable. The cheese should be snowy white in color. Yellowing is an indication of age and deterioration. Check the container for an expiration date. Ricotta should always be refrigerated in its container with the lid tightly affixed. Once opened, use within one week. Discard ricotta cheese at the first sign of any mold. Do not attempt to scrape off the moldy portion to use the rest. Ricotta may also be frozen up to 6 months. Defrost slowly in the refrigerator before using. Eight ounces of ricotta equals 1 cup. Dry cottage cheese may be substituted for ricotta in equal measures, but the flavor will be milder and a bit saltier. For some recipes, you may wish to smooth the cottage cheese by putting it through a blender with 1 tablespoon skim milk. ﻿Tofu can also be substituted in equal measures for ricotta in many recipes.